Chanchala, the restless and whimsical one, who does not like to stay in one place, is one of the names of Lakshmi . She loves to move around and so people are advised not to keep images of her in the house where she is shown standing; she may feel unwelcome and she may leave. 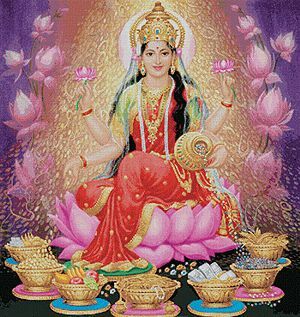 So in traditional images she is always shown seated comfortably on a lotus. The whole point of this rather visual characterization is to inform people that wealth loves to move. The value of wealth emerges only when it exchanges hands. Lakshmi’s symbol is her foot print and it is always drawn pointing into the house. The idea being to align the restless and mobile nature of the goddess with our own desire to see fortune favor us.